Since I am out of town right now, for this week's travel post I am going to skip my last post of our Colorado Adventure and share a story of a sweet little town that I spent time in while traveling. I will resume my Colorado Adventure posts next week. Wheaton, Illinois is located thirty miles from Chicago. 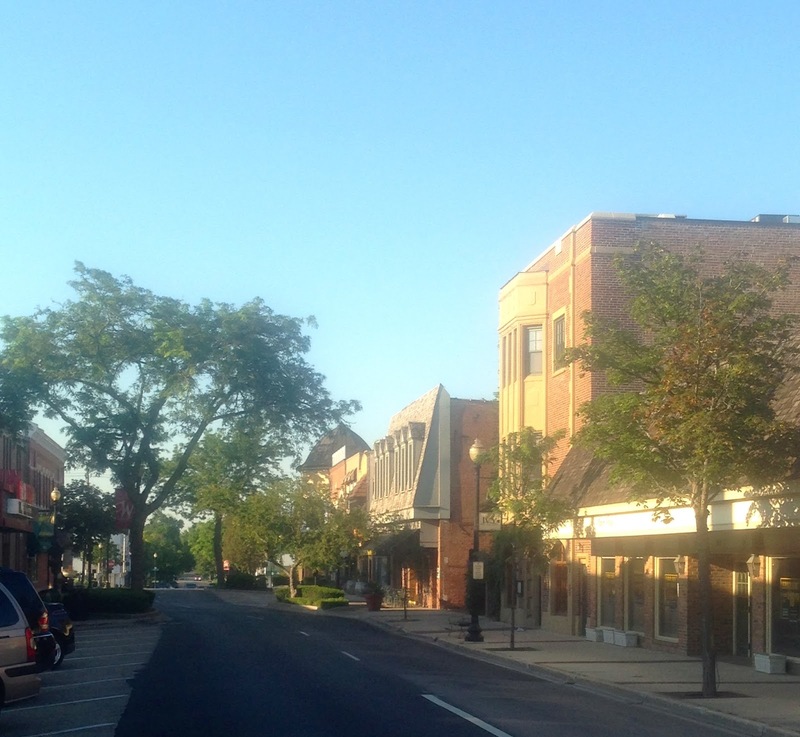 It has a lovely little downtown filled with cute shops and beautiful neighborhoods with mature trees and gorgeous homes. 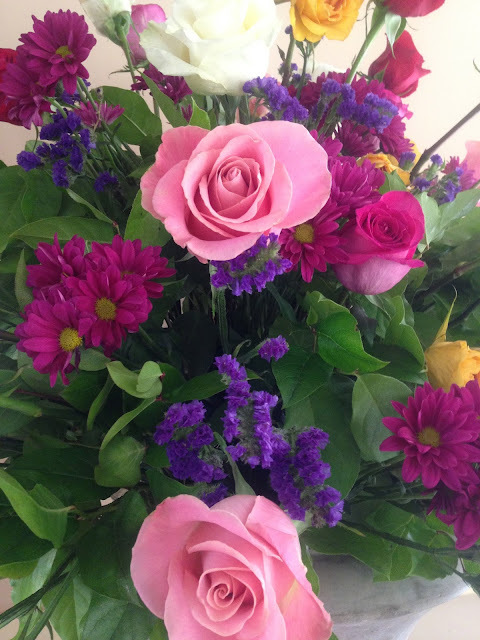 I've already shown you some of the beautiful flowers and neighborhood gardens in my Sunday Gardening Post. 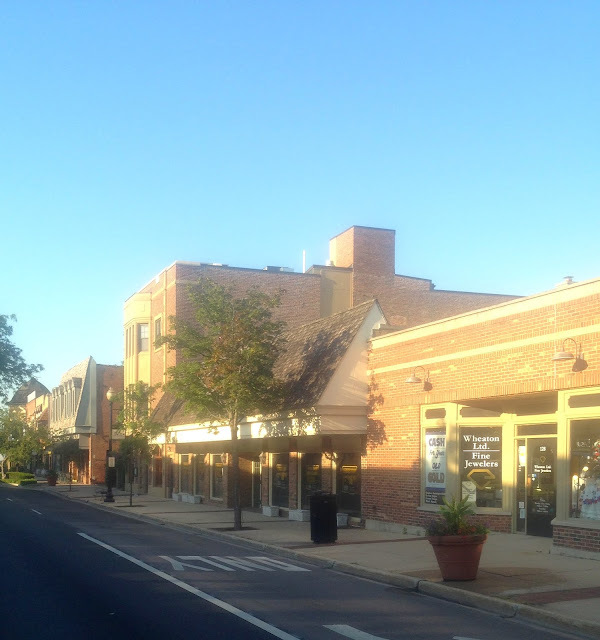 I first became familiar with Wheaton when I attended Wheaton College there over thirty years ago. My daughter and son-in-law are both alumni of Wheaton College. They lived in Wheaton for five years after graduation until they moved to Florida this week. 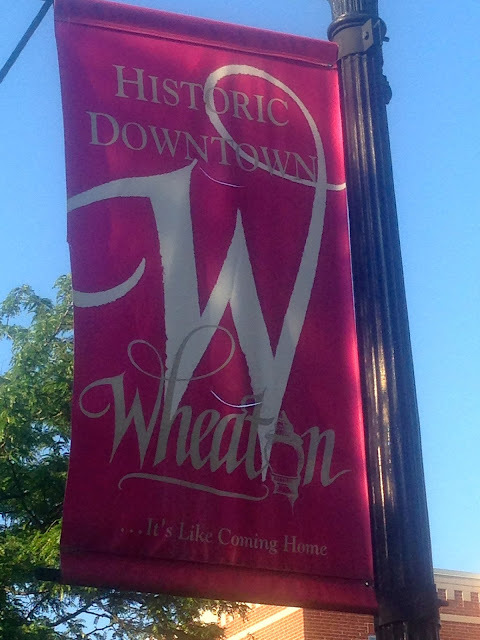 I was in Wheaton for a couple of days helping my daughter get ready for the move. I always woke up before the kids and there was not a coffee maker or coffee in the apartment because most items were already packed, so I put on my yoga pants and sneakers, and walked to the Starbucks ten minutes away. After I got my coffee, I would sit outside on the patio chairs and drink my coffee, play on my phone, and enjoy the beautiful day. The commuter train that takes all the Wheaton residents to their jobs in Chicago is right outside the Starbucks. I watched the trains go by each day I was there. After I finished my coffee, I would take a walk around town and peek inside all the shop windows. I love murals, so I stopped and admired this one that was painted on a restaurant wall. There was a beautiful water fountain with flowers beds surrounding it just kiddie corner of the Starbucks. Here are some pictures of the downtown storefronts in the early morning light. Now, if any one is on Instagram it's impossible to scroll through your feed without seeing a picture of a Macaron coming up. For months now, I've been seeing the pictures of these adorable pastries, and I had no idea what they were and what all the fuss was about. I really wanted to try one, but they didn't sell them in my neck of the woods. So when I saw a Macaron shop in downtown Wheaton, I was excited beyond excited! It was the sweetest little bakery, decorated all in pink and frills, with pictures of Macarons on the walls and Parisian nick-knacks. I love the pretty pastel colors of these little cookies. 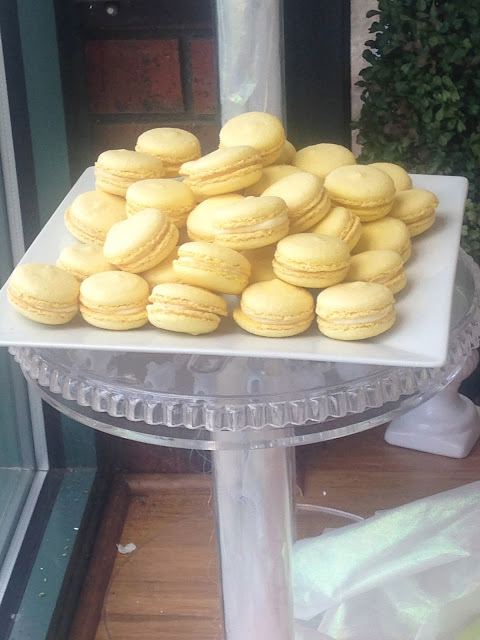 The store front window of this shop was filled with such attractive displays of Macarons. This was actually an example of a wedding cake of Macarons. There is a bride and groom figurine on top of the cookie stand. 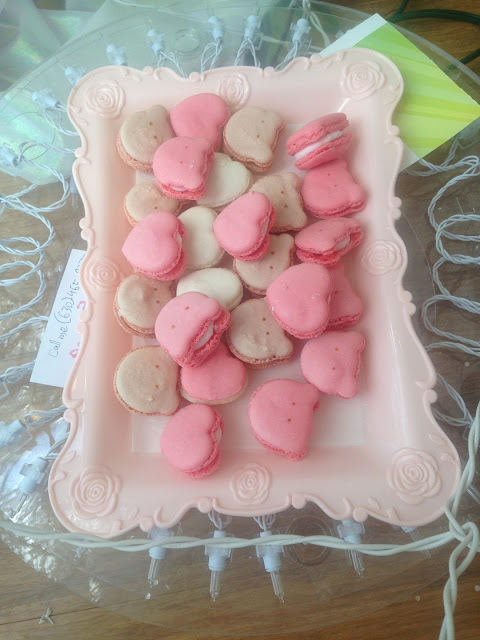 Here are some Macarons shaped like hearts for the loved one in your life, or a sweet Valentine's Day treat. 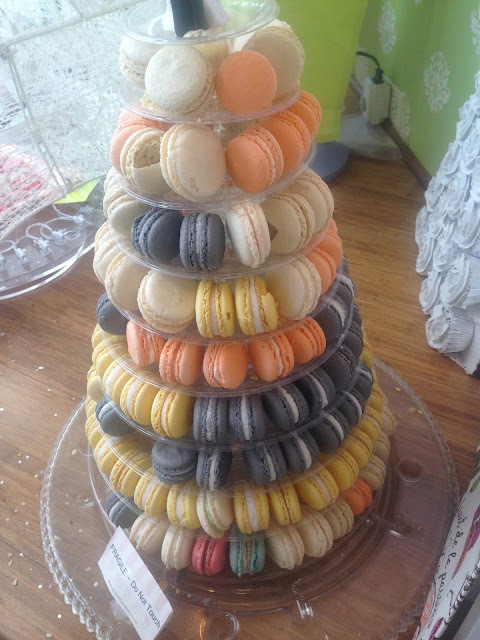 The store had every flavor of Macaron imaginable. Since neither my daughter nor I had ever tried one before, we each got one: Strawberry and Dark Chocolate. Here I am excited to try my first Dark Chocolate Macaron. It cost $1.75 for this one little cookie, which is basically just one big bite, or three itty, bitty, little bites. So, yeah, they are a little pricey! Macarons are gluten-free…hence the reason for the popularity. They are nice little treat for the health-conscious individual that's wants a little sugary treat without a lot of calories or fat. There are 97 calories and 5 grams of fat in one cookie. So what did I think of my first Macaron? I really liked it, but I'm not sure it was worth the cost. 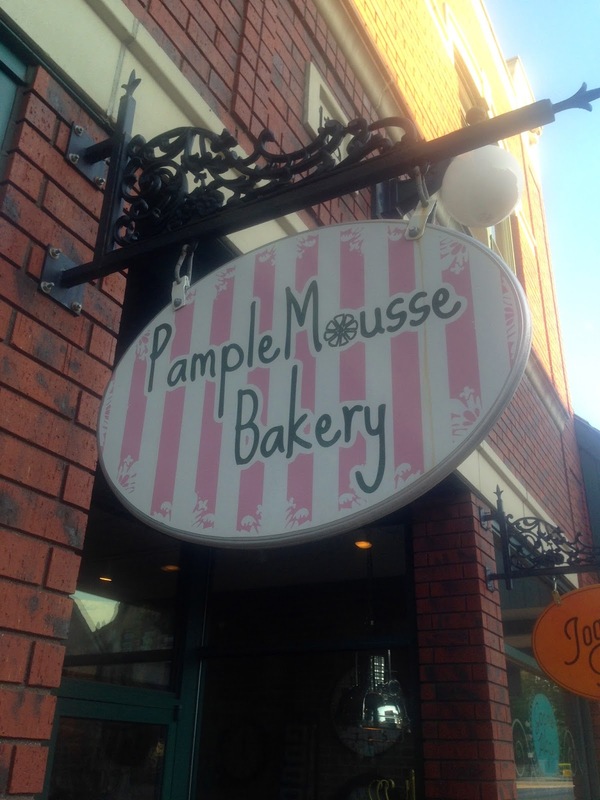 However, since they are a rare delicacy for me, I would probably buy one every time I did see a Macaron shop while traveling….just like I love to stop at Chocolate Shops when visiting other cities too. The next day, we went to a large, fancy grocery store where you could get Gelato, sushi, rotisserie chicken, or salad bar items. It also had a beautiful atrium filled with wrought iron tables, chairs, plants and flowers; so you could eat the item right there, or take it home with you. 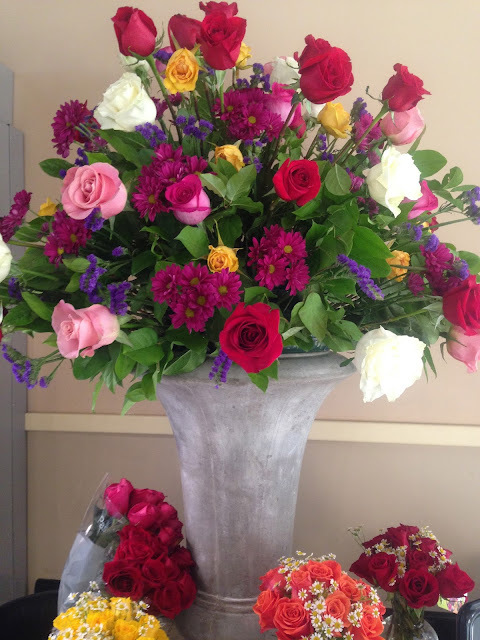 The floral shop was located right next to the atrium, and they had this beautiful floral arrangement on display. What magnificent color! We decided to get Gelato on our visit. 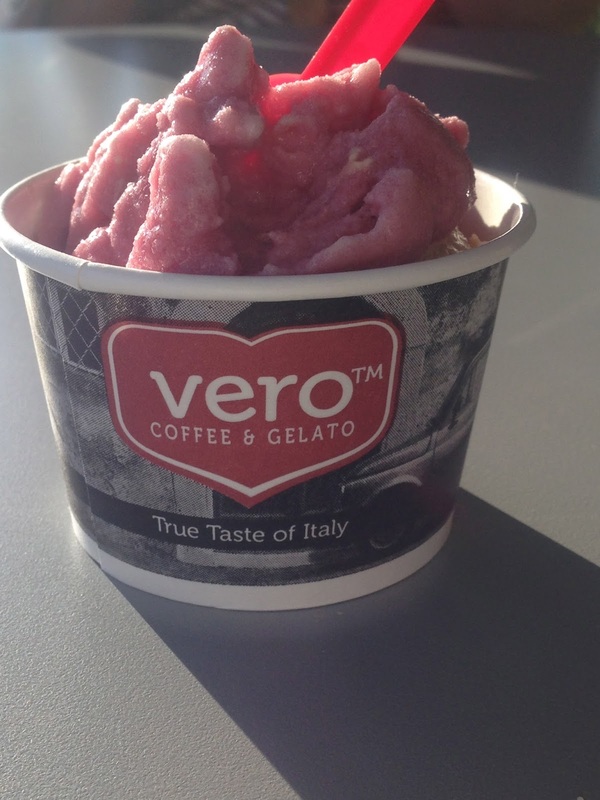 I've actually had Gelato before, and never quite understood what all the fuss was about. But, I certainly like it, and will eat it when it's available. On this day I got a Pomegranate Sorbet Gelato (which really wasn't gelato to me) and a Salted Caramel. My favorite of the two was the Sorbet…probably because I prefer sorbets over ice cream. I sure did enjoy basking in the sun eating my sorbet. I'm sure to all my city readers, this post was kinda humorous, but to me, to spend some time in an affluent town enjoying luxuries like Macarons, Starbucks Coffee, and Gelato, is a real treat. I live in a little town in NorthWestern Wisconsin, and we just don't have things here that other big city residents might take for granted. So I enjoy them while I can!